I was browsing the Center for Sacramento History’s website this morning when I came across this mystery image they would like your help in identifying. Please assist Center for Sacramento History staff in helping to identify this mystery image. Any information you can provide about the image context â€“ or the who, what, when, where, and why is appreciated. This image is from the Theodore Leonard Collection donated in 2001. The 35mm black and white negative was taken to document the “blight” in Sacramento as part of Mr. Leonard’s work with the Sacramento Redevelopment Agency and likely dates c.1955. While I’m on the topic, my son’s 4-H group recently toured the Archives and loved it. It’s a local treasure, for sure. And speaking of mystery images, where was the Ghetto Grotto Drive-in? Forwarded the image info to my wife you works at the State Library. 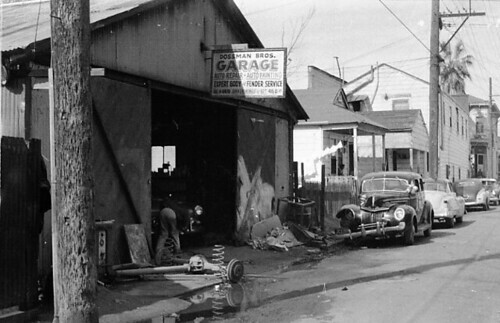 She quickly found the Dossman Bros. Garage in a 1955 directory located on 415 O street! Nice, Shane! The internet is cool. Well done. Next Next post: Takedown is coming!